I recently started playing a trial of EVE Online, an MMO sandbox set in space. After about a week of playing, I found myself really liking it, and started trying to articulate why I felt it was good, especially compared to many other MMOs that I have played and let die over the years. EVE Online was released in 2003. Being a space nut, I took notice early, but reports of its tremendous learning curve and internet issues stayed my hand. EVE is a sandbox game, where most aspects of the game are controlled by player run corporations. Massive "events" in EVE recieve special attention, because mostly these events happened occured "organically", i.e., without any intervention from the developers. The most recent of such events reach such epic proportions that I could no longer resist the temptation of playing the game. The Battle of Asakai, a giant battle which happened because of a literal "misclick". The Bloodbath of B-R5RB, the largest and most expensive battle in MMO history, happened because of a missed "rent" payment to an NPC faction. Quickly after you start the game, you'll be floating out in space in your "pod", en route to your first spaceship. Many MMOs can't afford to be too good looking, since they have to target a wide range of hardware, and the mean of their audience will always have fairly average rigs. EVE, on the other hand, can beef up the visuals, since its "landscape", space, is very sparse. It just so happens space is a very pretty thing, and CCP (the game's developers) exploits it to the fullest. EVE is not just the most beautiful MMO, it's also one of the most beautiful game, period. It's visuals are just one part of its unique ambience. EVE's soundscape is haunting and beautiful. Most of its ambient music has its roots in Icelandic new-age music, and its combat music is also tastefully rock-y. EVE's interface could easily stand amongst full blown operating systems as an equal. Given the insanely complex subsystems of EVE's gameplay, CCP has done a remarkable job of having a functional interface. In truth, new players will only see about basic 10% of the interface, while the others are neatly hidden until the player is ready for them. 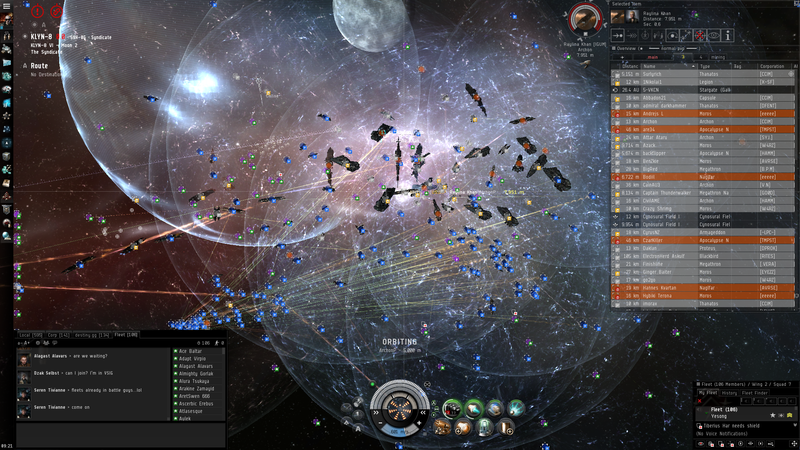 EVE supports many radically different playstyles, and each one has very different needs for the interface. CCP made sure to include an insane amount of flexibility in customizing the interface, such that even though EVE doesn't support interface modding, no one is even asking for it. While doing all this, it also manages to capture the essence of a modern/futuristic minimalist interface. Unlike most MMOs, there is no mad rush to max level just so you can enjoy the "real" content. The only real progression in EVE are "skills", which describe your proficiency is various aspects, like "Drone Interfacing", "Gunnery", "Propulsion Jamming", "Energy Grid Management", "Spaceship Command", etc. There are over a 100 different skills, each with 5 levels of proficiency. You can only be training one skill at a time. What's ingenious about skills training is it happens in real time, all the time. For example, "Gunnery Level 2" takes "2h 14m" to train. You can start put it in your training queue, log off, take care of other business, come back 2 hours and 14 minutes later, and that skill will be trained. The best part of this system is that it frees you from the pressure and compulsion of playing every waking moment to progress your skills because you want to make the most out of your subscription fee. It frees you from repetitively doing the most boring things just because they help you progress faster. When you log on to play, you can truly play, and not be chained by the promise of end game content. It is also ingenious from a business standpoint, as it entices your subscribers to stay. EVE has its own stock market. Yes. I'll let that sink in. The economy is almost completely controlled by the players. There is so much freedom that it is completely possible (and have been!) to pull off most real world scams like the classic Ponzi, and all this is by design. There is almost an ethereal balance between the various cogs that control the economy: the miners who mine the raw materials, the ship builders and researchers that make ships and their components, PvE and PvP players who buy them, and the stock traders who inadvertently keep the balance. Most MMOs have a concept of "Guilds", where a group of players unite under a banner. Guilds generally only act as a "private chatroom" in most games, where they perform PvE or PvP tasks together in a group. EVE goes a step further. Corporations are EVE's equivalent of Guilds, and several corporations can further form Alliances. Large corps can take control of large systems of EVE's galaxy, and this mechanic forms the backbone of most of EVE's politics: the natural human instinct to grab more space and resources. Combat can be extremely different from your expectations, especially if you're expecting something akin to a jet or dogfighting game. It is not as visually visceral, but it is even more chaotic, visceral and strategic. Combat generally falls into small scale gang wars, and large scale fleet wars. Gang wars are typical acts of piracy and "for fun" PvE. Fleet wars are usually grudge matches between large corporations and alliances. Another variety of progression (but less important than skills) is that of sapceships. You start off in a tiny frigate class spaceship (about the size of your room), and over time and money, you progress into larger and more beefy spaceships, eventually culminating is the Titan class ships, which can be as large as an entire city. One would assume the bigger means better, but not so in EVE. Another aspect of EVE's combat is the fact that it is in general very easy to escape combat, since all ships are equipped with warp drives. Found yourself backed into a corner? Just jump into warp speed and get away. A counter to this is called tackling, where small frigates which are very fast and hard to hit speed through enemy lines and disrupt the warp drives of larger ships to prevent them from fleeing. Since all you need to tackle is a cheap frigate, it is very easy for a relative newcomer to experience the fervour of gang or fleet warfare while still bringing a significant contribution to their group. Small frigates can also sometimes turn the entire tide of the battle, as documented in the promotional video above. In the video, the narrator's raiding group is ambushed by an enemy fleet who warped in at long range and started firing. The narrator's fleet was at a disadvantage since they had only equipped short range weapons, so the Fleet Commander orders the frigates to try and break through the enemy lines and drop a cynosaural field which allows his entire fleet to warp to his location, thus changing the odds in their favour and giving their short range weapons the definitive advantage. Large fleet battles are generally a whole other ball game, since it revolves around the presence of Titans, the largest ships in the game. The Bloodbath of B-R5RB was initially just a small skirmish, but when the Titans started jumping in, the entire dynamic changes. Frigates see less action here, since their role is filled by high speed Logistics and Covert Ops ships, who drop Interdiction Spheres (those rippling bubbles that you see in the above video) that prevent escape. You'll notice I didn't bother to explain the backstory of the universe itself, or the dynamic between different NPC factions. The truth is they have barely any effect on how the game plays, and is just a backdrop. A cool moment in the Clear Skies series. Sometimes, a good universe just begs for community created stories. Just like Halo had Red vs Blue, EVE has Clear Skies. Piggybacking off of EVE's rich universe, and using Half-Life tools, Clear Skies is an awesome example of what an inspired community can do for a game they love.